Wyoming is an outdoor lover’s paradise any time of year and is well-known for its world-class ski resorts, but that’s not all there is to do here in the cold season. 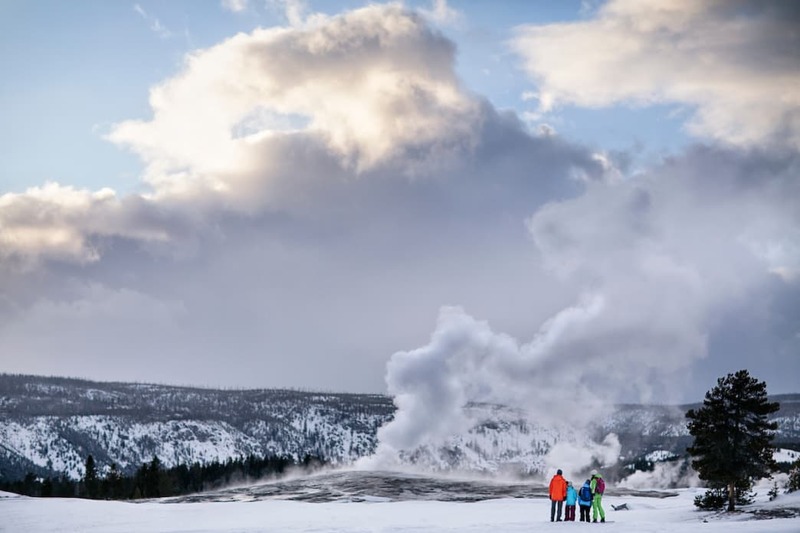 Whether you want to hit the backcountry slopes, see the quieter side of a national park, or experience a relaxing getaway at a hot springs resort, Wyoming has something to offer. Here are five of our best reasons why you should plan a trip to the Cowboy State this winter. From low-key sleigh rides to challenging backcountry skiing, there is something for everyone in Wyoming in the winter. And if you venture to the southwest corner of the state, you’ll find the oldest sand dunes in North America—without an ocean in sight! From the world-famous Jackson Hole Mountain Resort to the family-friendly Snowy Range Ski Area, there is a multitude of skiing options across the state. The locally owned White Pine Ski Area offers miles of cross-country skiing, and while Wyoming features tons of terrain great for avid skiers, Meadowlark Ski Lodge and Grand Targhee Resorts offer plenty of beginner and intermediate runs. Looking to try ice climbing? The South Fork Valley south of Cody has one of the largest waterfalls in the Lower 48 states. Plan your trip around the Cody Ice Festival, a multi-day event held in February with clinics from professionals and lots of climbing. For a once-in-a-lifetime experience, book a half- or full-day dog sledding tripor watch the Pedigree Stage Stop Race, founded by local and eight-time Iditarod competitor Frank Teasley. Starting in Jackson Hole, mushers and their dogs race to be the first team to get to Teton County in the northwest corner of the state. While in the summer you will likely run into crowds, families on summer vacation, and traffic, the winter is much quieter in our nation’s most popular national parks. Many of the roads and services are closed for the season, but if you are up for an adventure, you’ll have the place (mostly) to yourself. Grand Teton National Park offers ranger-led snowshoe walks, or set out on your own snowshoes or cross-country skis along the 15-mile road from Taggart Lake Trailhead to Signal Mountain Lodge. This stretch of road closes in November, making it a secluded winter wonderland to explore by foot. If backcountry skiing is your winter sport, there are a couple local guide companies that will take you out to spend the day on fresh powder in the backcountry. Road access is limited here and some parts of the park do close completely, but most of the park is open to skiers and snowshoers. Find more information here on planning your trip around the closures. At Yellowstone National Park in the winter, the geysers and wildlife are even more spectacular than during the summer. The entrances in Wyoming are closed to regular traffic during the winter, but that just means you’ll get to ride in on snowmobile or snowcoach, a unique way to see the park from a different perspective. Once you get in, many trails are open for snowshoeing or cross-country skiing. The effort will be well worth it to see popular attractions, like Old Faithful and the Grand Canyon of the Yellowstone, without the crowds. 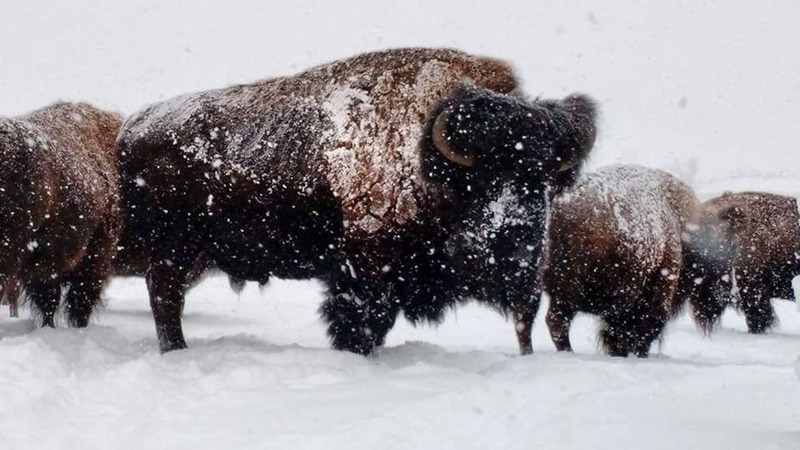 Winter also offers the opportunity to see bison, elk, river otters, and more. Check out our winter guide to Yellowstone National Park for more information on visiting this iconic national park during the colder months. More than 2,500 miles of snowmobile trails criss-cross throughout the state, including the 270-mile Continental Divide Snowmobile Trail System, so whether you bring your own or rent a vehicle once you get here, the hardest part will be choosing where to start! There are both ungroomed and groomed trails and the season typically takes place between December and April. Cruise through the hills and valleys of the Bear Lodge Mountains along the northwestern edge of the Black Hills uplift, or head for the Bighorn Mountains for steeper hills and untouched powder (with 218 trails, there’s something for just about every skill level!). The Black Hills System includes 40 miles in Wyoming and continues on for 295 more miles into South Dakota. Expect lots of deep powder here. Other options include Casper Mountain above the town of Casper, the Snowy Range (which receives about 25 feet of average snowfall), the Wyoming Range (with views at over 10,000 feet in elevation), and Yellowstone National Park. The park is only open to guided snowmobile parties and advanced reservations are recommended. Note: You’ll need a permit before you can ride. You can find more information about regulations, where to get a permit, and how much it will cost here. From bison in Yellowstone to mule deer and birds on Casper Mountain, wildlife is still very active in Wyoming in the winter. The National Elk Refuge in Jackson gives visitors the chance to see a wide variety of animals, including bison, coyotes, wolves, and eagles. Take a sleigh ride for a closer look at the several thousand elk who spend the winter here. The Seedskadee National Wildlife Refuge in Sweetwater County is a migratory hotspot for a variety of birds from hawks to trumpeter swans. Some of the roads are closed in the winter, so check for any closures before you head out there. Bear River State Park in Evanston is a great spot to see bison, elk, and even pronghorn—a unique mammal that looks like an antelope (but isn’t related to them at all). The Rocky Mountain bighorn sheep have been a part of this region for thousands of years, and the Whiskey Mountain bighorn sheep herd is the largest wintering herd in the Lower 48. Check out the National Bighorn Sheep Interpretive Center in Dubois for life-sized dioramas and more on the history of the animals. Of course, Wyoming has just about any winter sport you can imagine, but if you’re looking to heat things up on your next winter vacation, the Cowboy State has you covered. That’s right, we’re talking about hot springs. South of Jackson, Granite Hot Springs Pool is tucked away in a spruce, fir, and pine forest. In the winter, the hot springs are accessible by snowmobile, dog sled, skiing or fat biking. If relaxing is the name of your vacation game, try Saratoga Hot Springs Resort in Saratoga, west of Laramie. With a restaurant, brewery and plenty of in-room amenities, you’ll find everything you could ask for in one place here. The historic “hobo” pool along the Platte River is free and open to the public year round, 24/7. And of course, there’s also Hot Springs State Park in Thermopolis. Sitting along the Bighorn River, this year-round park offers a free bath house that is 100% fed by mineral hot springs and is maintained at a therapeutic 104 degrees Fahrenheit. For even more ideas of things to do in Wyoming any time of year, check out some of our resources here or request a copy of the Wyoming Official Travelers Journal (also available online).